Ensure that any electrical consumers (courtesy lights, etc.) are switched off before disconnecting or reconnecting the battery. When charging, stop the charger before connecting or disconnecting the battery. Do not place metal objects on the battery to avoid creating a short circuit between the terminals. Always wait at least one minute after the engine has been switched off before disconnecting a battery. Make sure that you reconnect the battery terminals after refitting. The battery charger must be compatible with a battery with nominal voltage of 12 volts. Do not disconnect the battery when the engine is running. Follow the instructions given by the manufacturer of the battery charger you are using. Special procedures may be required to charge some batteries. Contact your approved dealer. Avoid all risk of sparks which may cause an immediate explosion, and charge the battery in a well-ventilated area. Risk of serious injury. Handle the battery with care as it contains sulphuric acid, which must not come into contact with eyes or skin. If it does, wash the affected area with plenty of cold water. If necessary, consult a doctor. Ensure that naked flames, red hot objects and sparks do not come into contact with the battery as there is a risk of explosion. The engine may be hot when carrying out operations in close proximity. In addition, the engine cooling fan can come on at any moment. If you have to use the battery from another vehicle to start, obtain suitable jump leads (with a large cross section) from an approved dealer or, if you already have jump leads, ensure that they are in perfect condition. The two batteries must have an identical nominal voltage of 12 volts. The battery supplying the current should have a capacity (amp-hours, Ah) which is at least the same as that of the discharged battery. Ensure that there is no risk of contact between the two vehicles (risk of short circuiting when the positive terminals are connected) and that the discharged battery is properly connected. Switch off your vehicle ignition. Start the engine of the vehicle supplying the current and run it at an intermediate engine speed. 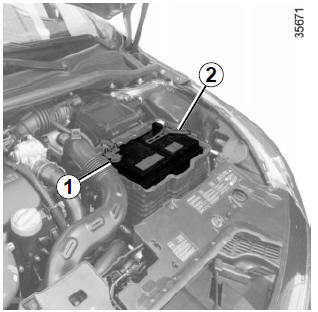 Depending on the vehicle, unclip the battery cover. Connect the positive cable A to the support on the (+) terminal 1, then to the (+) terminal 4 of the battery supplying the current. Connect the negative cable B to the (–) terminal 3 of the battery supplying the current and then to the (–) terminal 2 of the discharged battery. 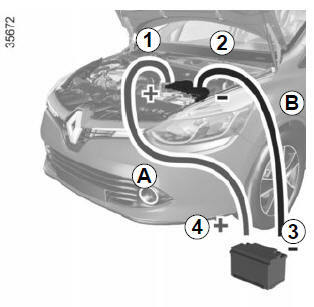 Start the engine, and as soon as it starts running, disconnect cables A and B in reverse order ( 2 - 3 - 4 - 1 ). Check that there is no contact between leads A and B and that the positive lead A is not touching any metal parts on the vehicle supplying the current.